Questions about our Training Programs? Come and join us at the Running Room for our weekly Run Club. It's free! We have practice runs/walks from all Running Room locations on on Wednesday, Friday evenings and Saturday, Sunday mornings at any Running Room location. Day and Time may vary by location. (contact your local Running Room for further details). Practice is absolutely open to all runners and walkers as we send out multiple groups under the leadership of pace group leaders. You can take advantage of running or walking with a group and meet new friends. Join us for the fun and motivation. In addition to the practice sessions as a member of the Running Room Club you will receive free on-line access to the Running Room Running Club on-line. As an on-line member you will have access to your own customized training log, manage your own personal profile and with your consent we will send email updates from Running Room, including announcements, local and national event information or promotional offers which we think would be of interest to you. You can withdraw your consent at any time. If you are a Rewards Club member or are registered in one of our Training Programs then you are already a member. If you would like to be a member of the Running Room Club, simply fill in your name and e-mail address, nothing else is required. Track your rides and runs via your iPhone, Android or GPS device, analyze your performance, and compare with friends. 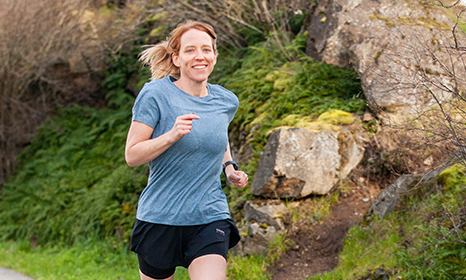 Join with runners across North America to share your progress, routes and passion for running.